Paella made-in-the-USA usually requires some substitutions. First of all, there's the problem of the paella pan. The authentic pan is wide and flat, originally intended to set over a wood fire, and doesn't fit very well on a stove top. So I rummage in kitchens until I find a deep skillet or flat-bottomed wok that will hold the rice, chicken and seafood. The shopping list. Good extra virgin olive oil is essential for paella. It gives authentic flavor. And medium-short-grain rice. If I can't find real Spanish rice, I substitute Italian arborio rice. Shrimp, clams or mussels and squid, if I can get it, because it adds so much flavor. I like to get boneless chicken thighs and cut them into three or four pieces, so that they cook quickly with the sofrito.Green beans, cut in short lengths and par-boiled, and one artichoke, cut in sixths and added to the sofrito. Once all the ingredients are prepped, the cooking takes less than an hour--about 20 minutes for the sofrito, 20 minutes for the rice and another 10 minutes for the paella to rest. 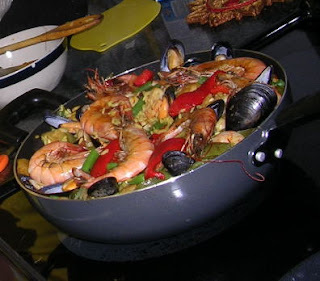 Paella is a process of developing flavor, as each ingredient is added to the pan. Don't fret about the chicken or the shrimp overcooking--it's purpose is to produce flavorful rice. I like to use some unpeeled shrimp to garnish the finished paella. I saute them in the oil before beginning the sofrito, as that adds flavor to the oil. Shrimp to flavor the olive oil. 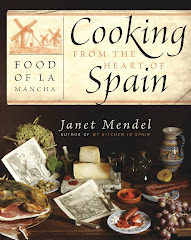 In my own kitchen in Spain, I make a stock of shrimp heads and peels, chicken bones, plus liquid from steaming open clams or mussels. But working in someone else's kitchen, I find it easier to purchase ready-made low-sodium chicken broth. Either add the broth to the pan and bring it to a boil before adding the rice or else heat the broth in another pan and add to the rice in the paella. Daniel adds shrimp to the paella. About the saffron: because it's so expensive to buy in the US, I bring it from Spain. I try to find only the best saffron with denominacion de origen La Mancha. Crush the saffron threads in a small mortar (or tea cup if you don't have a mortar) and add about 1/4 cup very warm water. Let the saffron infuse 10 minutes or longer. If you don't have saffron, use a drop or two of yellow food coloring plus pimenton (Spanish paprika, but not the smoked kind). 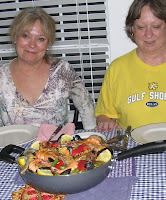 Dinner guest, Giselle, helps with the paella. One important tip: once the rice, chicken, seafood and broth have been combined, bring everything to a boil, then DON'T STIR THE PAELLA AGAIN. Unlike risotto, for paella, you want to avoid developing the starch, or the rice will be gummy. Cook on a high heat for about 5 minutes, then turn the heat down to a simmer and cook until the rice is al dente. Remove from the heat, tent with foil and allow to rest at least 10 minutes. The rice will finish cooking. 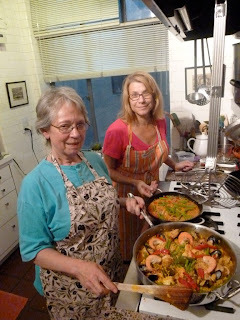 This photo by Giselle Martin is from her blog about making paella. See her story at Inspired Life & Home. Eli serves paella a la americana. Heat the oil in a large pan. Add the whole, unpeeled shrimp and saute them until pink on both sides. Remove the shrimp and reserve. Add the pieces of chicken to the oil and saute on a medium-high heat until they are browned on both sides. Add the squid and fry. Add the peppers and garlic and continue sauteing. Add the artichokes. (If you cut them immediately before adding to the pan, they do not need to be rubbed with lemon.) Next add the tomatoes and the liquid. Bring the liquid to a boil and add the rice. Stir it in to combine all the ingredients. Stir in the saffron, pepper and salt to taste (depending on the saltiness of the stock). Let everything cook on a medium- heat for 5 minutes, then turn the heat down to low and continue to cook until rice is just tender, about 15 minutes more. Scatter the green beans over the top of the paella. 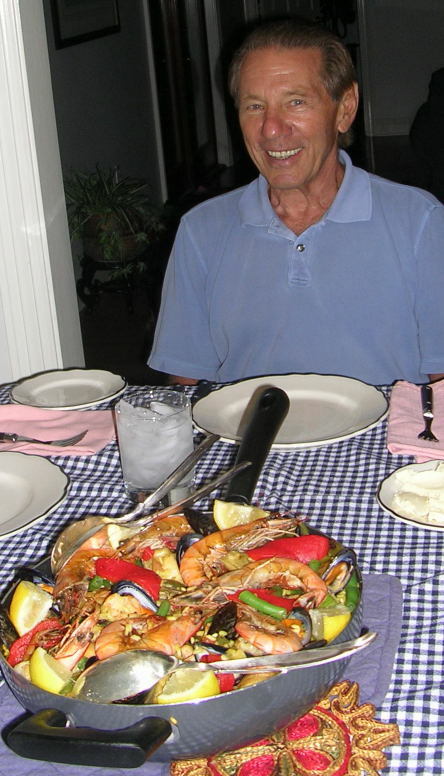 Place the sauteed shrimp and cooked clams or mussels on top and garnish with strips of red pepper. Remove from heat, cover with foil and let the paella rest 10 minutes. Serve garnished with lemon wedges. 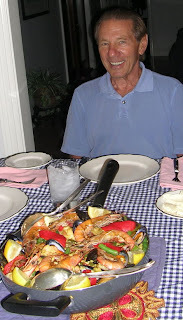 In Louisiana, easy to find shrimp with heads, but mussels came from Canada! VJ and paella, Louisiana style. Cousins Avril and Pat in LA. I will try to make paella in Paris. Ready for more up here -- come back to NY, Janet! Hola, me alegro mucho de poder conocer tu blog. Veo que eres una enamorada de la gastronomía española, debe ser porque eres una gourmet excelente. Hi, Janet. We are glad to write on your blog. Congratulations for this excellent recipe. The paella was really delicious. It's made us felt like in Spanish's lands in Atlanta... Thank you for share with us. We hope to see you again. Byeee!!! Javier: gracias por tu comentario y bienvenido. 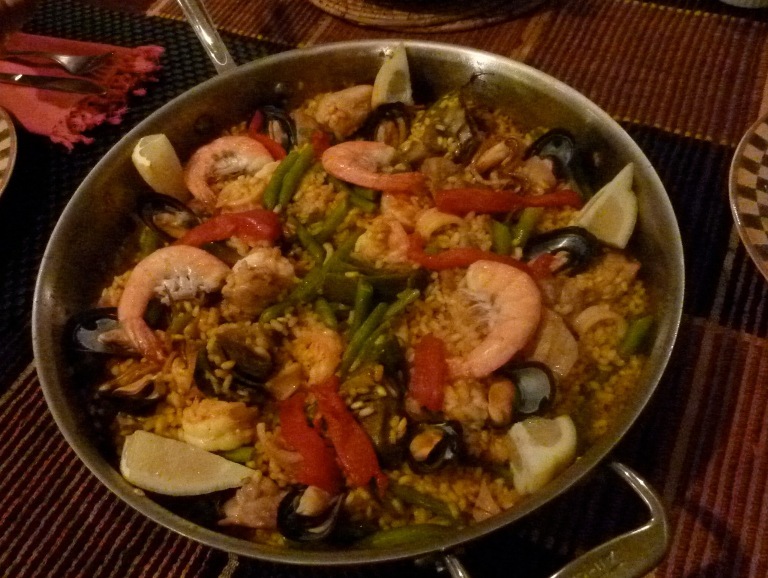 Maigua y Alex: Glad that you enjoyed the paella! 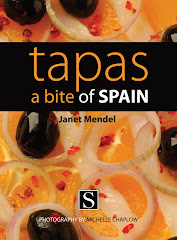 Next year in Andalucía? Paella in Andalucia???... Sounds great! Why not!??? Voy, con su permiso, a agregarla en "Mi cocina" como favoritos y por supuesto con un enlace para que puedan visitarla desde mi blog. Es mi homenaje y agradecimiento por su cocina, tan española, tan bien hecha y que divulga con tanta ilusión por lo que puedo ver. La invito a visitar mi blog, donde podrá encontrar unas 200 entradas de platos tipicos malagueños y un poquito de nuestra historia, entre las cerca de 650 entradas la gran mayoria platos españolas. 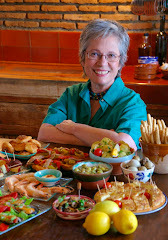 Carmen Rosa: Gracias por tus palabras y por incluir un enlace a mi blog en el tuyo, http://micocinacarmenrosa.blogspot.com/ Hice una visita y veo muchos platos deliciosos. Saludos a una colega! 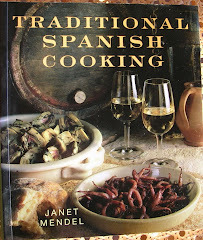 I just posted an entry on my blog recommending your books (among several I think are good on Spanish cuisine), based on what I had read in your blog. I hope you are satisfied with how I represented them. Being married to a proud Valencia, uncompromising on paella adaptations, I liked your approach to calling it "a la Americana". Expat: Thanks for the recommendation! 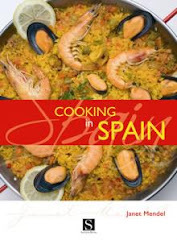 When I was in the US, I found it necessary to make some adjustments to authentic paella recipe. 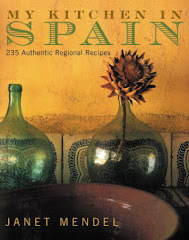 However, I've included the true Valencia version in MY KITCHEN IN SPAIN. I have the imported paella rice, pimenton and saffron, plus Spanish olive oil and a great paella pan. Come over and we'll cook! Richard: Thanks for the invite! I'm back on the Costa del Sol now, so I'll have to take a "raincheck." Saludos!